Every building has a story to tell. It typically starts with a committed team led by a visionary who imagines what can be and acts to create something from an idea, cause, or belief. Designing and building such living stories for religious communities are some of the most remarkable acts of faith, pun intended, that spawn even more stories for generations through evangelism, worship, fellowship, pastoral care, education, missions, outreach, and more. Is your church leadership thinking about a new worship center, church school, multi-use building, or renovation? Then think long term. The decisions and design you make today may last for decades or more. Cheap construction can be the most expensive in the long-run due to repair, replacement, and maintenance costs. Get design and built right the first time. 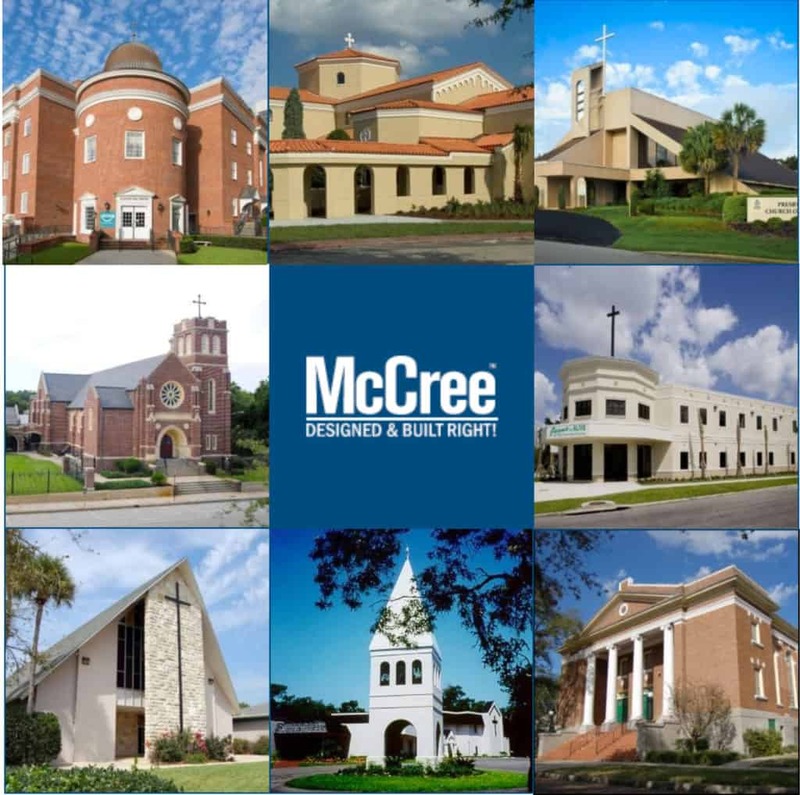 Visit the Portfolio of faith-based projects designed and built recently and over the decades by McCree. February 20, 2019, McCree co-sponsored and hosted the Building Your Church’s Future event. Visit this page to access talented professionals, practical tips for church building, and resources for your church building design and construction needs. Download (scroll down and look on the right) 10 Workspace Saving Tips guide. Request a copy via email of the Concept to Keys Church Leaders’ Guidebook produced by McCree. Discover the 10 steps needed to go from idea to occupancy. Also, feel free to use the form at the bottom of this page to make your request. Exercise stewardship. Let’s start with a conversation. Designing and building is a long-term relationship—we’ll be together a long time, and trust is vital. Unless you already have a master plan and/or architectural drawing where you just need McCree to be your general contractor, typically, the next logical step is to start small with a feasibility study. Per Luke’s urging, it provides the very best way to “calculate the cost” and gain the most value well in advance of breaking ground.